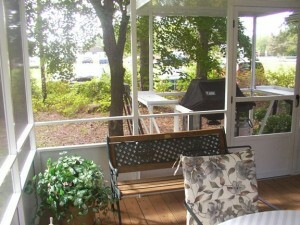 We all love our decks and patio’s but we seldom get full use from them. From rain or blazing heat to flies and mosquitoes it is often unpleasant if not unbearable on the deck or patio. Mason Corporation provides some great solutions to get better use of these areas. Offerings include a versatile line of low maintenance, prefinished aluminum products, ranging from stand alone roof systems, to screen and glass enclosures and even walkway covers and carports. We have been using Mason Corp. products for over 20 years and they have proven to be a fine addition to the product lines we promote. If you just need some shade or shelter Mason Corp. roof panels are available in several standard or insulated styles. Because these roof panels can be installed in flat or low slope applications they are perfect for areas that can’t easily be covered with conventional framing methods. Couple that with Mason Corp. screen or glass room systems and the design possibilities are tremendous. Mason Corp. screen rooms can be configured with many options. 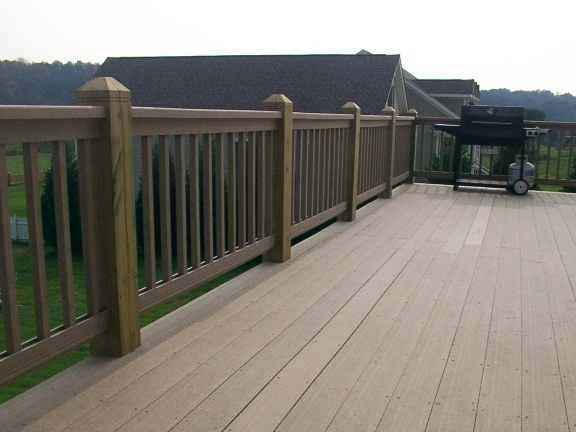 Knee walls can give a degree of privacy and eliminate the need for handrails in elevated areas. Kick plates are panels that are much lower than knee walls that still give some protection for small pets and reduce screen tears from pets or as the name implies from accidental “kicks.” Picket railings give an open full view appearance while meeting code and safety requirements for elevated areas. For non elevated areas, full floor to ceiling screening gives unobstructed views and maximum air circulation. In addition there is a varied selection of screening options such as aluminum in silver, charcoal and black colors and fiberglass in colors of black and grey. Also available are specialty screens such as tiny mesh insect screens, solar screens and pet screens which are seven times stronger than standard fiberglass screens. A heavy duty spline-in-groove instillation design ensures smooth drum tight screen panels while allowing easy replacement in case of rips or tears. 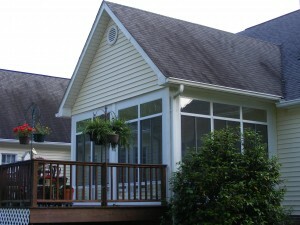 For year round enjoyment Mason Corp. offers glass enclosure systems to satisfy a wide variety of needs. Mason Corp. glass rooms are easily heated for winter use and can be air-conditioned in the summer, additionally window options are available that provide up to fifty percent screen area when all windows are opened. Wall configurations include insulated kick panels or knee walls below, with fixed, sliding, casement, or single and double hung windows above. Active windows are available in aluminum or vinyl and when used with the knee walls allow for some sensation of privacy while providing great views. For those who want maximum visibility fixed glass lower panels may be used instead of kick plates and fixed glass transoms are available for use above active windows. Floor to ceiling fixed glass panels are also available. 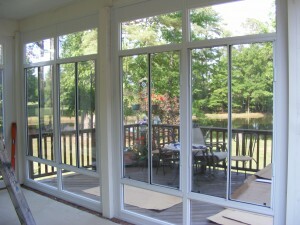 Window options include Lo-E and argon gas fill to further enhance energy efficiency. (Interior) of Mason Corp glass enclosure system built by Wood’s Home Maintenance Service. (exterior) of Mason Corp. glass room. 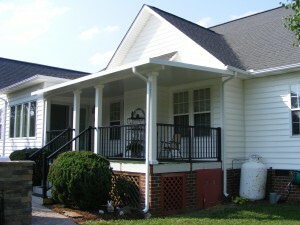 Built by Wood’s Home Maintenance Service. Mason Corp. screen and glass enclosure systems are designed to be used with any of the various roofing systems available from Mason Corp. or with almost any existing roof. All of their aluminum products are prefinished in white, almond or bronze colors for years of maintenance free enjoyment. Wood’s Home Maintenance Service builds Mason Corp. screen and glass rooms as well as many styles of traditional stick built enclosures. Let us build a back yard get away for you to relax or entertain in today. This entry was posted in Screen and Glass Rooms and tagged Carport, Florida room, Four season room, Glass Room, Porch, Roofing, Screen porch, Screen Room. Bookmark the permalink.